Last night was MAD real. If you follow me on social media, you saw that I had returned to my beloved alma mater, Syracuse University. Since I've graduated four years ago, I've been back to campus quite a few times, but this was definitely the most special of them all. Each year to welcome the incoming freshman class, the Division of Student Affairs puts together an awesome production called Home To The Dome. Basically, it's a pep rally to hype up the newest members of #OrangeNation and welcome them to the family. 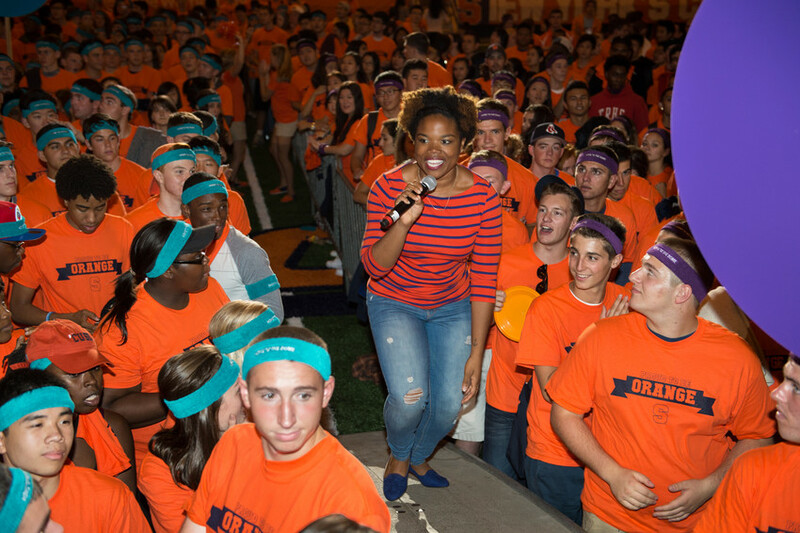 From learning the fight song and alma mater to repping their respective residence halls, the freshmen get their first taste of what it really means to have Orange Pride. This year, a handful of Generation Orange alumni were invited back to share stories on their defining Orange moments. I was lucky enough to be a part of this special group, and share my special moment that took place in The Dome almost five years ago. Now, I'm not sharing this experience to boast or brag - I just REALLY love my school and completely appreciated my college experience. The four years I spent at SU not only molded me into the woman that I am today, but it also brought some of the most wonderful people into my life that I'm so thankful to call family. The one piece of advice that I shared with the Class of 2019 is to be purposeful in leaving their mark on Syracuse University. For me, my mark will forever be standing on that 50 yard line among thousands of football fans and being crowned the first black homecoming queen in 16 years. But that moment was about so much more getting the crown, learning SU history and campaigning for votes. It was about the people who had helped me get to that point, and truly understanding what it means to be apart of a community that wants you to succeed. Furthermore, it's about sewing seeds into that community, and making sure that you're always giving back and not expecting anything in return. To my dearest Syracuse, thank you for the awesome opportunities and countless memories you have (and continue) to give me. I'm so happy to call you home.